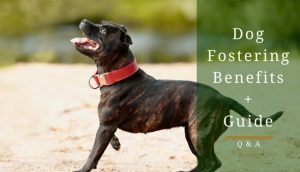 Keeping your dog’s teeth healthy is a must for staffy owners. Your staffy’s teeth need to be able to fight against the daily wear and tear. As with humans, a daily routine of brushing can be effective against bacteria and food building up; a bacteria and food buildup can lead to things like plaque and painful gum irritations/infections. We all know it can be a challenge to keep your dog's teeth clean and recognise when there may be a problem. 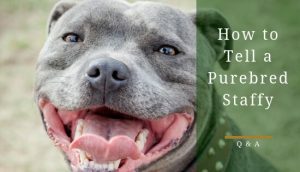 Fortunately, this article will help you discover several tips to for keeping your staffy’s teeth and gums healthy as well as teach you how to see when something isn't quite right. 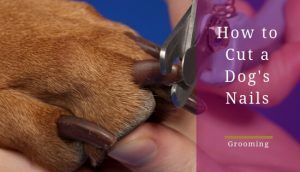 It can be tricky to see whether your dog has any dental issues because they rarely show sign of pain of discomfort when it comes to their teeth. Therefore, it’s important to keep a close eye out for other symptom that could indicate a problem. According to the American Veterinary Dental College, most dogs show evidence of periodontal disease by the time they are 3 years old. WebMD’s pet section say the actual figure is around 80% of dogs. If you notice any of these signs, it is time to take a trip you a veterinary dentist to get the issue solved before it gets worse. It is also important to note that many of the signs above get dismissed as part of the ageing. They are not. 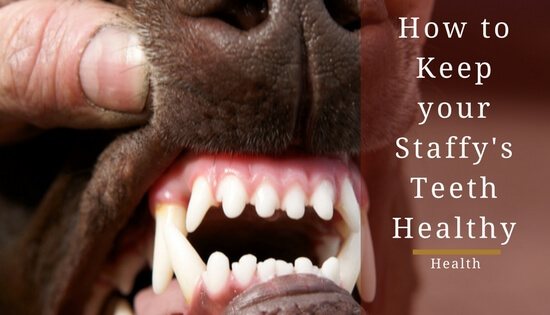 Now you know the indicators of dental problems for your staffy, check out the tips below to help you minimize the risks and keep your dog’s teeth health on point. Just like humans, brushing’s the most effective way to ensure your staffy’s teeth remain healthy. It’s important to try to keep up a daily routine of brushing because there is new bacteria invading your staffy’s mouth every minute of every day. In terms of how to prepare, be sure to purchase specialised dog toothpaste because you’re staffy, most likely, won’t learn to spit. Therefore, your staffy needs toothpaste that’s safe to swallow and human toothpaste can contain ingredients that are very harmful to them. However, a human toothbrush can work just fine for some dogs, but this depends on your dog’s size. Just make sure you use one of an appropriate size for your dog’s mouth. First, you should place a small piece of toothpaste on your finger and let your staffy smell and lick it. This will make them more comfortable with the idea of putting the toothpaste in their mouth. If you’re staffy isn’t put off by the toothpaste, proceed to brush without it. Then, start brushing like you would your own teeth. Some toothpaste for dog is flavoured, which is great since brushing becomes a treat for them. As you know, your staffy loves to feel special through you giving them snacks. So, why not make those snacks something that helps their teeth? Even though vegetables and fruits might not help directly against plaque on the teeth’s surface, they will remove food from your staffy’s teeth to fight against food build up. There are several safe fruits and vegetables that you’re staffy would benefit from eating: apples, bananas, blueberries (only a couple at a time), brussels sprouts, cantaloupe, carrots, green beans, pumpkin, spinach, sweet potatoes, and watermelon (seedless). Of course, make sure to give your staffy these snacks in manageable portions or slices: the smaller the better. Check out this link for making sweet potato dog chews at home. Grapes, raisins, onions, avocado, peaches, plums, apricots, cherries, mushrooms, rhubarb, white potatoes, and tomatoes. Each of these food items can be very harmful to your staffy and should be avoided at all times. Undoubtedly, your staffy loves chewing things. So, use their favourite pastime to your advantage by buying some durable, rubber chew toys. These toys are great at scraping and cleaning teeth, effectively, battling against that pesky food and bacteria buildup. You should encourage them to use these rubber toys after each meal to fully take advantage of their ability to clean your staffy’s teeth. Rubber chew toys are also more tooth and gum-friendly than rigid animal-product toys and bones. Kong Extreme chew toy. 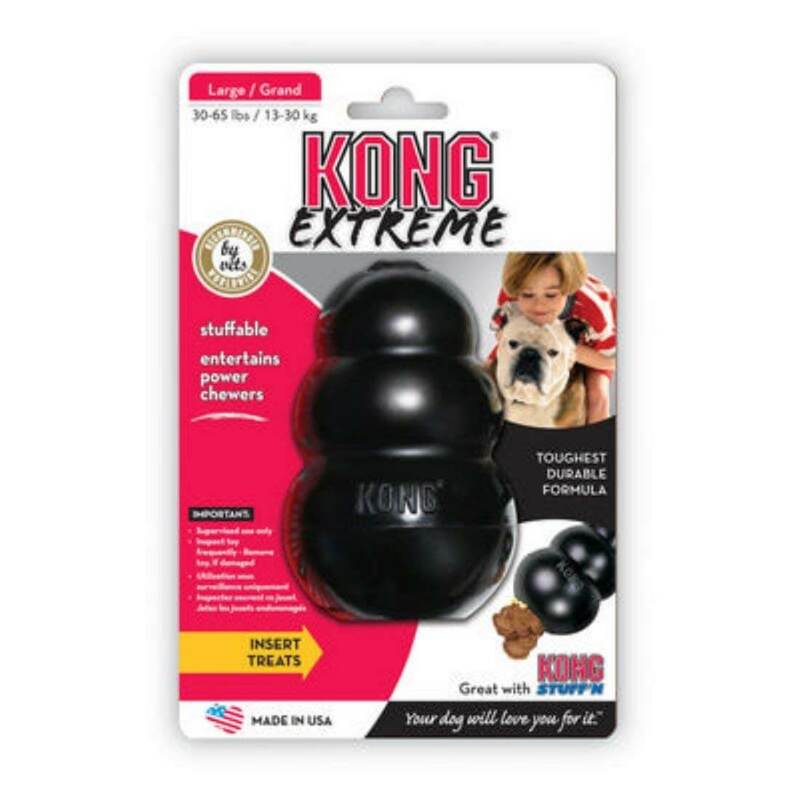 Kong is the brand everybody thinks of when it comes to durable chew toys. This one can also be stuffed with treats to make it more enticing to your dog. 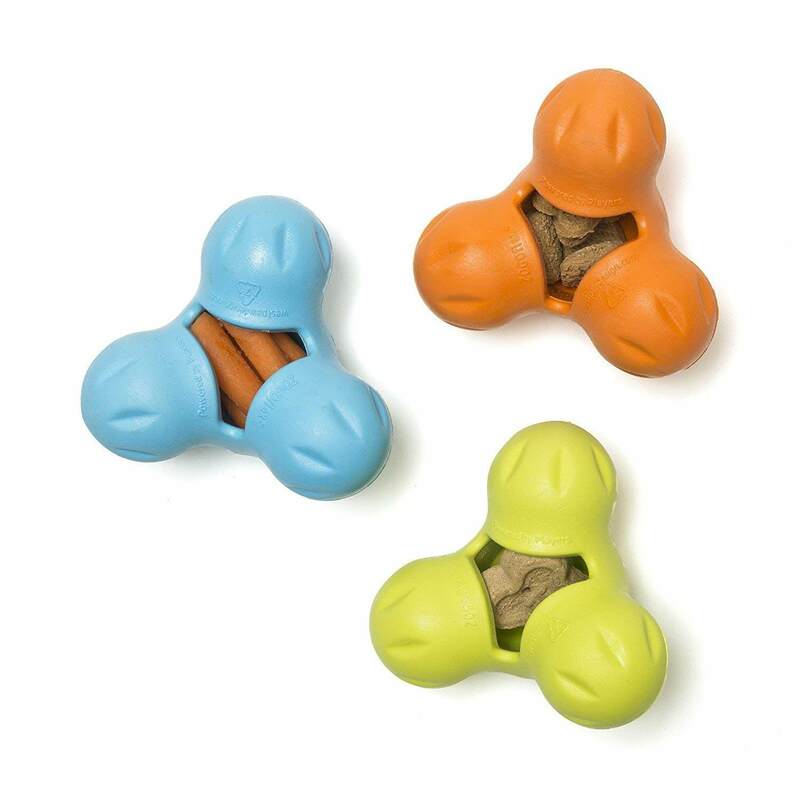 Another excellent option because of its’ rather interesting shape is this West Paw Zogoflex toy, which can also be stuffed with treats to keep your pup interested. Some owners on Amazon have even rated it as more durable than the Kong toy but this experience is likely to vary from dog to dog. 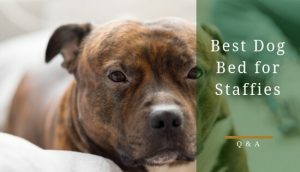 If you have a hard time brushing your staffy’s teeth, it’s could be helpful to feed them with dry food since it's much less likely to stick to their teeth than wet food. 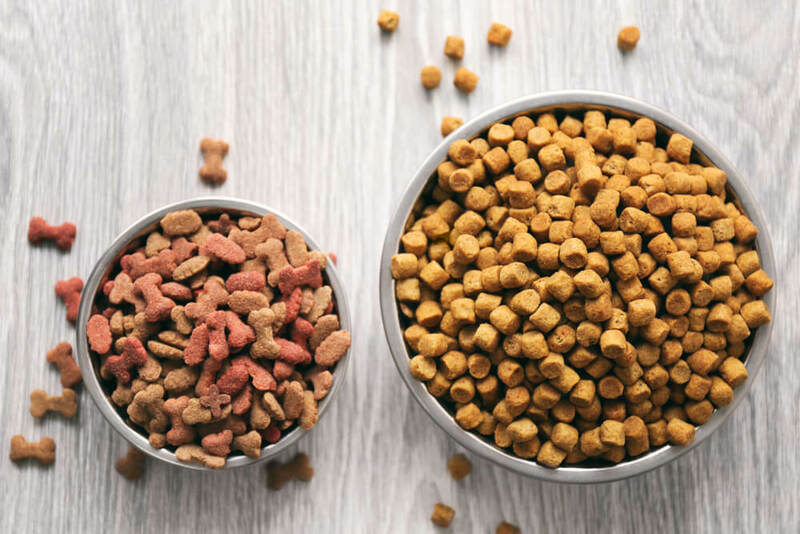 Dry food should have a lower likeliness to cause food build up and lead to your staffy’s teeth to decay. Put simply, it reduces the chance of there being a problem. However, don’t use this as an excuse to avoid taking any other preventive measures. Using dry food simply helps to mitigate the problem but isn’t likely to solve it by itself. Choosing a high-quality food will also provide your dog with the necessary vitamins and minerals to promote good oral health. One of the most highly regarded dog food brand is Orijen, which is pricier than many foods but also higher quality. Click here to have a look at Orijen’s grain-free food on Amazon. Yes, I know, your staffy chewing a tennis ball is extremely adorable. 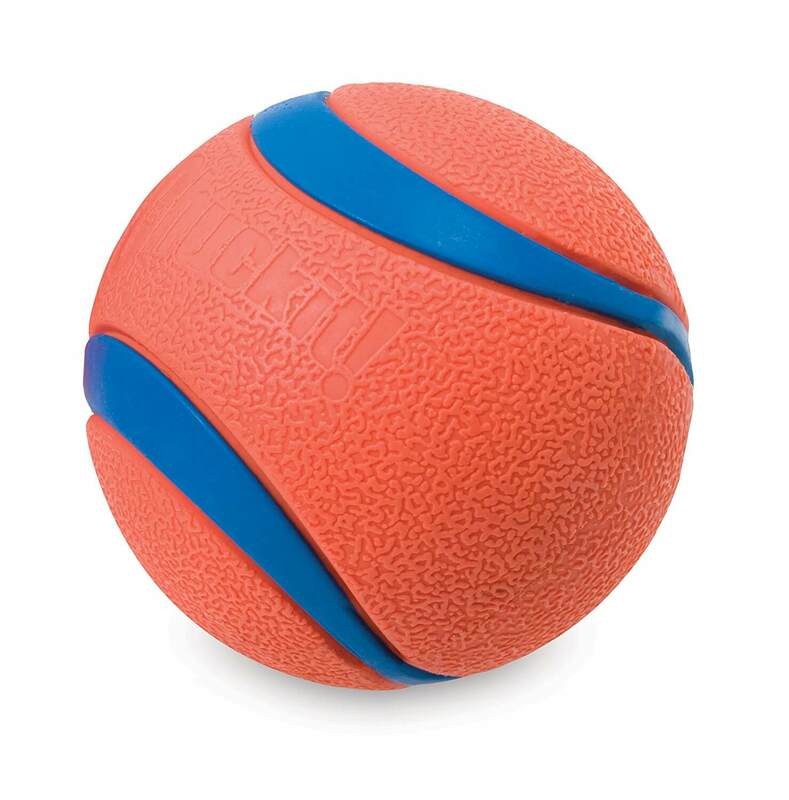 However, it can be a hazard toward their dental health because of the green nylon fuzz on the outside of the ball. Sadly, prolonged exposure to the nylon fuzz can break down your staffy’s enamel and lead to teeth decay thanks to its abrasive texture. 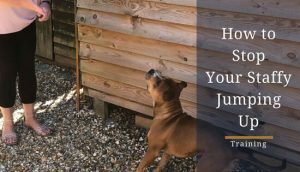 Moreover, the tennis ball can get pebbles and small rocks lodged into the nylon fuzz causing further damage to your staffy’s teeth. So, please don’t sacrifice your staffy’s dental health for the fun a tennis ball can provide. After all, there are other toys that are much safer and can give your dog just as much enjoyment. If you want a safer, longer-lasting alternative, you can get a Chuck-it ball. They are bright, they float and still fit inside most ball launchers. Here’s the link to them on Amazon. Sometimes, it just may not be possible for one reason or another to brush your dog’s teeth properly. 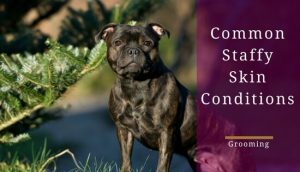 On the days where you are unable to fully brush your staffy’s teeth, you can use a wipe or pad to remove the bacteria from your staffy’s gum line. Just pick up a piece of gauze and wipe away those build-ups. Even better, you can pick up dental pads at your local pet shop if you’d feel more comfortable with a product specific for teeth wiping. Please be aware, this isn’t meant to completely replace brushing because it’s less effective and won’t fully protect your staffy’s teeth. Just use it as “better than nothing” alternative when you really need to. 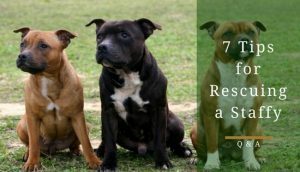 Animal chews such as bones, hooves, or pig ears can be an effective way to consume your staffy’s time. Unfortunately, they’re extremely rigid, which can lead to your staffy to chip or break their teeth. In addition, little pieces can break off and become a choking hazard for your staffy. 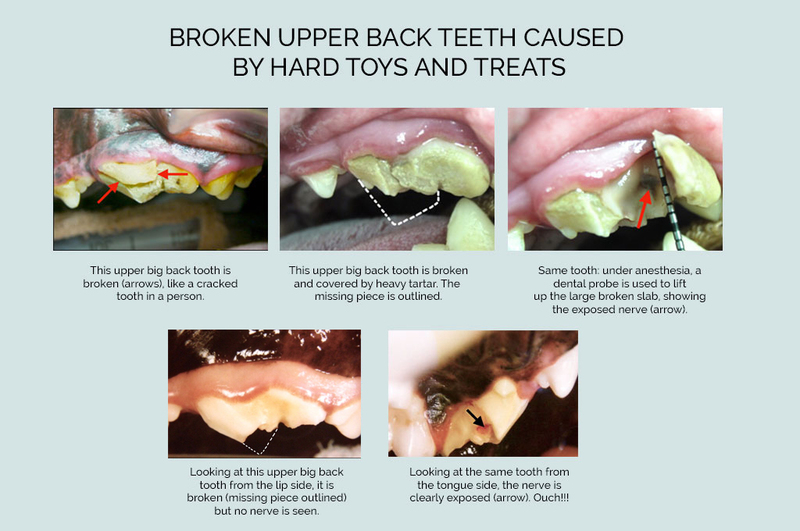 This is an image showing the potential damage caused by using hard dog chews and toys. This image was found on HelpStopPetDentalPain.com. which is a non-profit organisation dedicated to helping owners prevent and deal with their pet's dental issues. Just like with tennis balls, a dog with their bone might seem like a natural fit but there are some needless health risks that come with these animal chews. Staffies also tend to get way too excited over edible animal chews and will sometimes try to swallow the entire chew or large parts of it in one go. Your staffy’s dental health’s extremely important to their happiness. Just think about how painful toothaches or any tooth pain is for you. 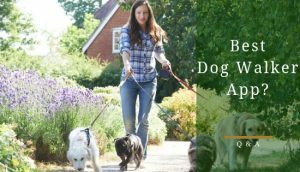 Use these seven tips on a consistent basis with your dog to avoid causing them pain and get away from unnecessary vet bills for you.